Vic Firth with his signature drumsticks. The timpani provides an essential rhythmic pulse for the orchestra. 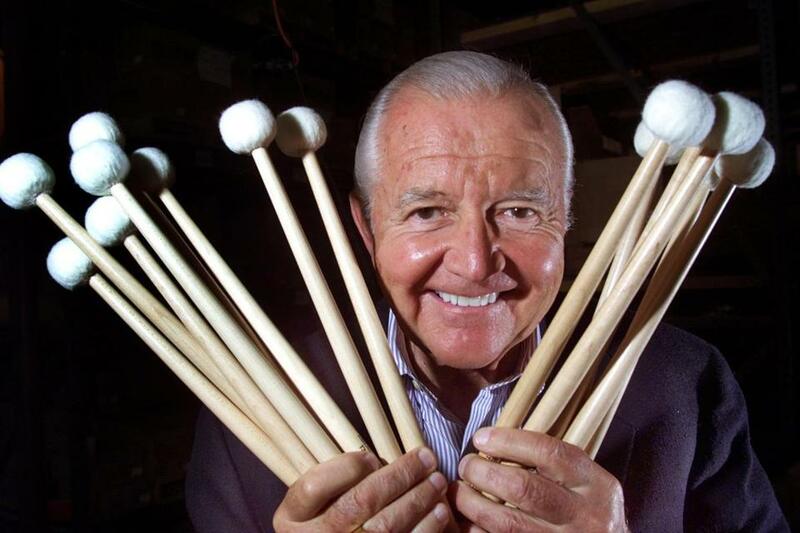 In the case of Everett “Vic” Firth, the iconic timpanist of the Boston Symphony Orchestra from 1956 to 2002, that pulse was artful, well- integrated, and renowned on both sides of the footlights. Mr. Firth, who also taught at New England Conservatory from 1952 to 1995 and founded a highly successful drumsticks company, died in his Boston home Sunday of pancreatic cancer. He was 85. When BSO music director Charles Munch hired Mr. Firth as a percussionist in 1952, he was the orchestra’s youngest member, at 21. He assumed the position of timpanist four years later, playing under four music directors and countless guest conductors over the years. During that period he became known for subtle choices of particular sticks to render specific passages in a score. Silverstein recalled that the late British conductor Sir Colin Davis, in particular, queried Mr. Firth about his choices so that he could convey the wisdom of “the gentleman in Boston” to timpanists in other orchestras. Mr. Firth was born into a musical family in Winchester and grew up in Maine. He began on his father’s instrument, the trumpet, but switched early on to percussion. He attended NEC, studying with Roman Szulc, then timpanist with the BSO, while also taking lessons with Saul Goodman, timpanist of the New York Philharmonic. As his career advanced, Mr. Firth became unhappy with the quality of the available drumsticks and began making his own. Soon percussionists from other orchestras were asking him for sticks, and the enterprise grew into a highly successful business, founded in 1963 and now operating in more than 120 countries. In 2002, Mr. Firth was producing 100,000 pairs of drumsticks each week out of a factory based in Maine. His company merged with Zildjian, a Norwell-based cymbal and drumsticks company, in 2010. “Through his travel with the symphony, he was able to create relationships around the world,” said Jim Doyle, vice president of Vic Firth Co., adding that the timpanist was known to arrive in a new city, pull out a phone book, and visit the local music store to discuss his sticks. Mr. Firth’s percussion business brought him celebrity within a broader drumming world that extended well beyond the sphere of classical music. His daughters, who worked in the family business, suggested that he appear on occasion with rock bands, which Mr. Firth did. He was once reprimanded by a BSO manager for having performed in Providence with the Grateful Dead. As news of his death spread early this week, percussionists from across many genres took to Twitter and Facebook in large numbers to pay tribute. Mr. Firth leaves his wife, Olga; two daughters, Tracy of Walpole and Kelly DeChristopher of Scituate; and a sister, Sherrill Auld of Edgewater, Md. Memorial services will be private. New England Conservatory plans to name a percussion studio in his honor.